Often overlooked for the resorts of Cabo, Baja California Sur’s quieter capital is a gorgeous celebration of history and marine life. The area swelters in the summer, but winters are pleasant and the prime time for whale watching. Fly into San José del Cabo, a two-and-a-half-hour direct flight from LAX, and bask in the scenic cactus-lined desert on the three-hour drive to La Paz. Stop in El Triunfo, a tiny former mining town 30 miles south of La Paz, for resident-led historical hiking tours through mining ruins, which include two towering smokestacks. Make sure to swing by Cafe El Triunfo (Calle Ayuntamiento; +52 612-157-1625) for freshly baked garlic bread and cookies. 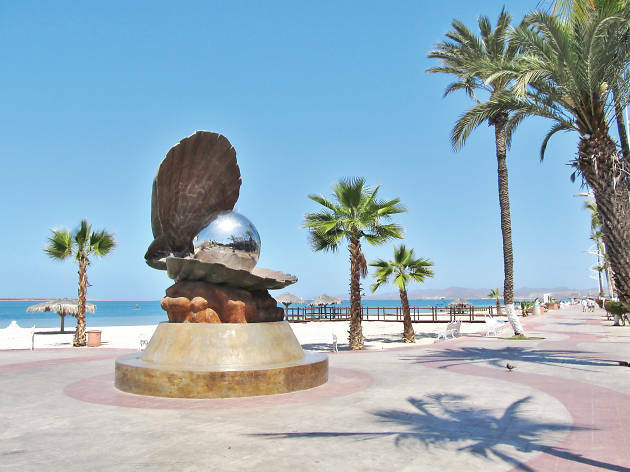 Once in La Paz, take a seaside stroll along the Malecón (Parallel to Paseo Alvaro Obregon), a recently remodeled three-mile boardwalk lined with restaurants, bars, shops and public art. 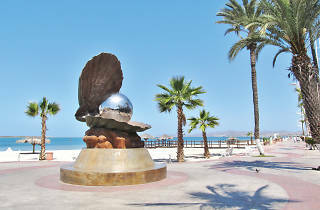 One sculpture—a massive, reflective pearl in an open clamshell—pays homage to La Paz’s past of pearl diving. Between February 8 and 13, the route hosts Carnaval La Paz, a massive street fest with performances and parades. For a once-in-a-lifetime spectacle, take a boat tour to come face-to-face with peaceful gray whales, who mate and calve in Baja during winter. Museo de la Ballena, a whale museum (Paseo Alvaro Obregon and 16 de Septiembre; +52 612-129-6987), reveals even more about the diverse creatures found in the Sea of Cortez, once called the “aquarium of the world” by explorer Jacques Cousteau. Have a nightcap like a local at La Miserable (Calle Belisario Dominguez 274; +52 612- 157-3217), a lively mescal bar where smoky cocktails pair well with massive street hot dogs that put L.A.’s late-night bacon-wrapped indulgences to shame.